Still around and it NEVER left store shelves except to change from a cyclamate formula to one with saccarine. Mom drank this diet crap....I tasted it....not too good for kids. Love this stuff now but back when I was a kid I hated it. Wink was good! Squirt was the other carbonated grapefruit drink. Diet Grapefruit soda. Taken off market 'cause of FDA ban on cyclamates. Brought back years later when aspartame became popular. 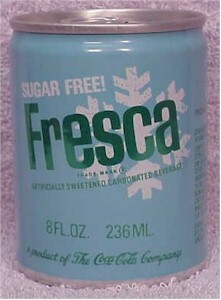 Coca-Cola refused to market it with saccarine as the sweetner. Never had a non-diet version that honor went to Canada Drys "Wink". Ah, grapefruit flavor. No wonder I hated it. It was best when it originally came out, in a cloudy, grapefruit juice texture and was served ice-cold. Now it's clear, but it's still not bad (to me). I absolutely HATED this stuff.